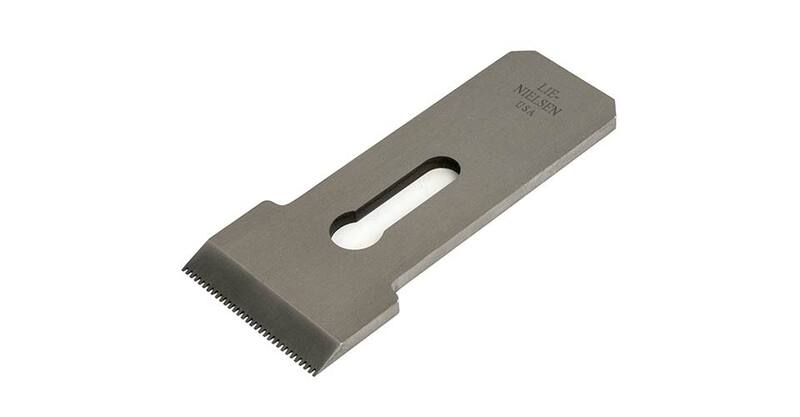 Toothed blades have small chisel-like teeth .030" (.762mm) wide, and spaced .030" apart. They are used for heavy stock removal in difficult grain. Follow with a fine-set Smoothing Plane. Please Note: Toothed blades are great for quick, heavy stock removal. However, something like a knot in pine can break the teeth so be careful around difficult spots. We recommend that you hone your toothed blade with a secondary bevel of 30 degrees or higher depending on the type of wood you are planing. The blade comes with a 25° flat ground bevel; it sits in the tool at 12°, making the included cutting angle 37°. The blade is A2 cryogenically treated Tool Steel, hardened to Rockwell 60-62 and double tempered. Our heat treating technique ensures that the blade will take and hold a very fine edge for a long time. After heat treating, the blade is fully surface ground on the top, back, and cutting edge, giving a smooth, flat surface that will take a mirror finish very quickly. Blades should be kept lightly oiled or waxed to prevent rust. We recommend Jojoba Oil, a plant based oil product that is non-toxic, odor-free and easy to use. Also, in our shop, we use a fine abrasive handblock to remove any light surface oxide from tool bodies and blades. Jojoba Oil and abrasive handblocks are available from us.